** The listed Flare Diameters are not full size due to limitations on PTFE flare diameters. † 3A - Clean out of place (COP) only. For more information see 3-A Sanitary Fittings. Because Bioflex Ultra Hose has better flow rates than some larger bore sizes of Convoluted PTFE hose, it represents a superior alternative when fitted with the larger size flanges in some applications. It is, however, necessary to also “Step-Up” the PTFE-lined bore, to ensure a diameter match with the mating connector. 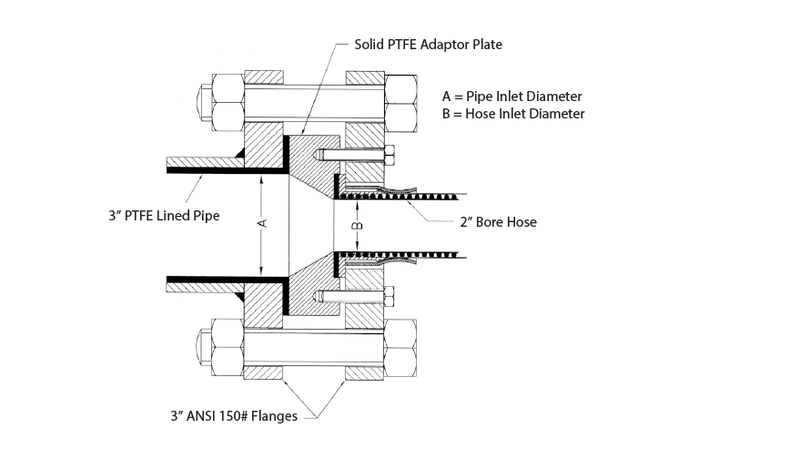 This is best achieved using a solid PTFE Adaptor Plate, as shown in the drawing.